Anatolikoi Eugeneis: During the struggles of the Empire, its noblemen, Eugeneis in Greek were to be found in the midst of battle, always front and center. Even if the empire's hold on their territories may resemble that of a tide, they would always consider themselves lords and masters of their land and the people entrusted in their keep. It wasn't unlikely that they would hire others to fight against fellow eugeneis for lands and wealth, or indeed, follow their sovereign into battle, even if their religion would differ from their own./n/nThe Eugeneis (noblemen) of the Anatolian plateaus would many times find themselves alone from the Empire which would lose ground and leave them alone to fend for themselves any which way they could. Many times this would mean fighting for the former enemies of the empire, the Seljuks now their own overlords. 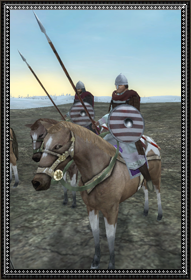 Being lower class noblemen and the descendants of nobility they would go in battle on horseback but not wearing the full kataphraktos suit. They would fight as lancers, with a paramerion longsword as backup. It would have to be long enough as a short sword wouldn't be of much use to a cavalry man whose reach needs to be long. Wearing a cast iron helmet and an iron lamellar armor over a leather "thorakomachos"/subarmalis or vest which would diffuse somehow blunt strokes. The Eugeneis are off to fight for the enemies of their overlord. If those enemies are the empire from which their ancestors descended, so much the worse.